Hi everyone! Nicki here… I thought I would write a little about some of my favourite trousers from all of the SS19 collections! Trousers always tend to be a little ‘trickier’ than buying a top. Everyone is a different shape, size… height.. need I go on! I used to hate shopping for trousers on the highstreet, so I used to stick to my favourite brand of jeans… that was until I started working at Walkers! Thankfully I have now found SO many options, and styles that actually fit me correctly! I’m between a UK10-12 and I’m 5ft8. The usual struggle is finding something that fits me nicely around the waist, whilst still fitting around my hips/bum.. and then the length! I’m sure we all have a list of criteria …I thought I would share with you all, the trousers I have chosen for myself this season! First up, the mint trousers from Rundholz Black Label (RH190228) They are beautifully soft and stretchy, with a slight drop crotch. I can’t wait to wear these on a summers day, they look so flattering and are super comfortable! I have been searching for a lighter coloured summer trouser – and these are what I’ve been waiting for! Next, ‘Clean Pant’ from Black by K&M. Everyone is now joking in the office that it only took 18months to get me in a pair of harem trousers… but I fell in love with these the moment I tried them on during our buying trip! They are the most comfortable pair of trousers I have ever worn, whilst being edgy and super stylish at the same time! I wear them with Affirmative top (BK190055) and my Lurdes Bergada hooded jacket from winter. Lastly, these slim leg trousers also from Lurdes Bergada ( no surpises there!) I also own the SS18 version of these, and loved them so much I wanted another pair! These are slightly more cropped than last years! I find them to be such a great wardrobe staple and be worn as a smarter trouser or dressed casually! They are super flattering and my go-to black trouser! This Rundholz main collection dress is unusual, creative and striking. The small check print resembles a chequer board print. 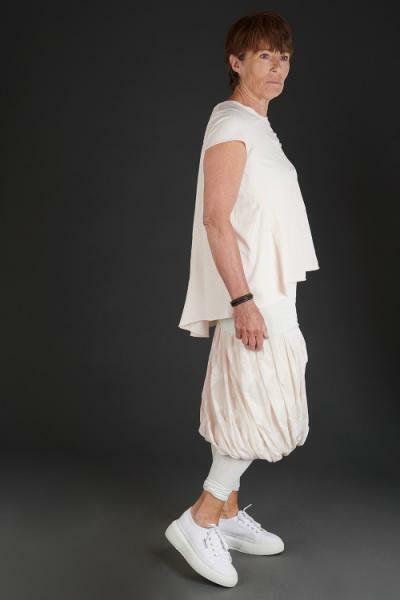 The cotton is so soft and lightweight; a joy to wear. The unique cut makes the dress twist slightly round the body, the sleeves are asymmetric with one side sleeveless and the other is more of a drop shoulder. One of the main features is the loose pocket that also creates a drape to the side. Essential tube skirt from Rundholz Black Label. Comes in black and houndstooth print. So stretchy and soft woven fabric- one of our faves. Versatile and easy to style. You can wear it as a everyday look like Jill – she is wearing the Mama b striped t-shirt for a summer-time look. With a lovely shape at the front that curves and holds its shape, it is slightly shorter at the back. Very flattering and a classic from Rundholz. 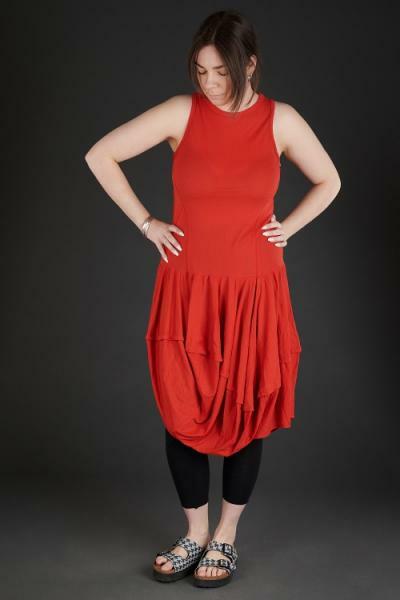 Stylish dropped waist dress from Lurdes is soft, stretchy and looks great. The slim bodice and bouncy bubble shaped skirt is striking and shows off the designers gresat design. Subtle seams down the body are flattering and create shape at the waist. 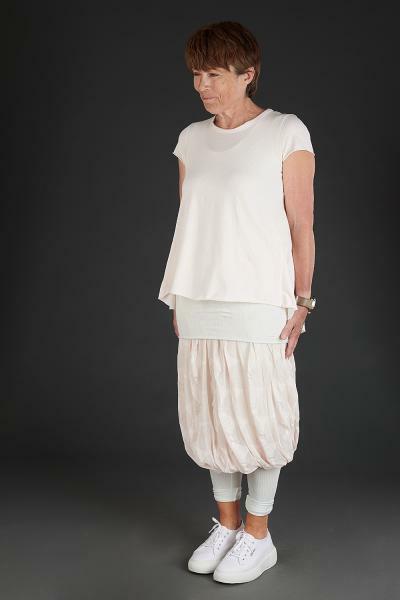 The skirt has lovely drapes and a asymmetric hem line . With leggings you can wear this casually throughout summer or you could easily dress this up for an occasion. 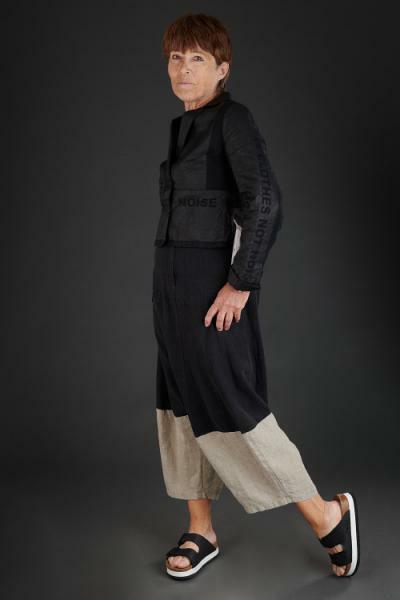 I love this smart outfit from Lurdes. Both linen fabrics with a twist. The jacket is cropped, slim fit but with a great boxy shape to show off your waist. With interesting resin coated panels- classic creative Lurdes Bergada detailling. You can wear this jacket many ways- here we have styled it in a more formal/ work look way, but you can easily wear it as a casual day to day with some jersey harems. The trousers are high waisted and flat at the front and back- which is SO flattering. The drop crotch is subtle and classy, the tappered ankle is flattering. Block colour is so on trend!-But still using neutrals so will never go out of fashion. Jill loved wearing this look, she said its even great for a wedding if you aren’t a dress person. Fabulous ruffle skirt from Rundholz Black Label. Interesting skirt with cotton mesh overlay fabric with creative spot design- subtle effect. We have styled it as an all pastel look! We paired the outfit with chunky platfrom trainers to keep the look balanced and in proportion. The cap-sleeve top is shorter at the front and goes longer at the back showing off the a-line floaty shape. We put a slim vest underneath and over the skirt to create a flattering stream-line look.